Well, I got the tires installed two weeks ago, but it's been raining ever since. I only managed to get a quick pic the day they were installed. Truck is dirty with the old tires in the back. Wish I had time to get in the mud a little. I'm very happy though with the results. The factory wheels keep the tires tucked in the body and keep them from rubbing on the fenders with the low lift. Pics don't do it justice until you go stand next to the tires and they're almost to your waist. 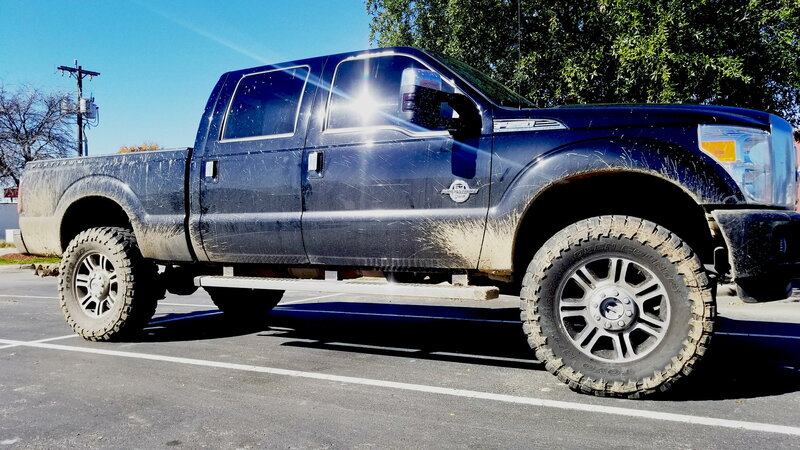 With the lift and tires, the whole truck is about 6" higher. The wife and kids love it, except the wife is only a little unhappy about climbing in. But she rarely gets in with me. I probably lost 2-3mpg.........worth it! Last edited by JonGTR; 09-17-2018 at 08:11 AM. Went to the ranch to play after a few rains. I couldn't get it stuck and didn't get as dirty as I expected. The kids and I had fun. Need to remember to take some pics while there. Now thats a properly "detailed" truck right there! Good to have it back up! Custom cat back price good or no? ?